One of the area's favorite holiday tradition returns to North Shore Music Theatre for the first time since 2007 as spirits fly, snow falls, and a man named Scrooge learns the true meaning of Christmas. 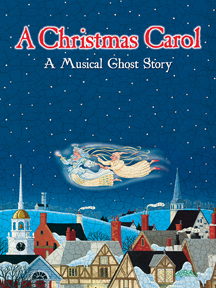 "A Christmas Carol," directed by writer and former NSMT Artistic Director and Executive Producer Jon Kimbell, will run for 16 performances only, from December 3 - 23. Based on the Charles Dickens classic, "A Christmas Carol" tells the tale of curmudgeonly miser Ebenezer Scrooge, who's visited by the ghosts of Christmases Past, Present, and Future hoping to change his destiny and save his soul. Audiences will travel with Scrooge as he sets off on a strange and magical journey, where he ultimately discovers the true spirit of the holiday season. With special effects, traditional and original songs, and colorful costumes, "A Christmas Carol" has as entertained more than a million people including more then 100,000 students since its premiere at NSMT in 1989. 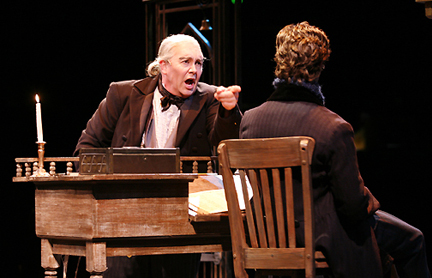 As noted, this year’s production of "A Christmas Carol" will one again star David Coffee (at left), marking David’s 17th year playing Ebenezer Scrooge at NSMT. The cast also includes: Maureen Brennan returning for her 8th year as the Ghost of Christmas Past and Mrs. Cratchit; Cheryl McMahon, part of the original 1989 cast, returning for her 17th year playing Mrs. Dilbur and Mrs Fezziwig; and Tom Staggs returning for his 10th year playing Jacob Marley; plus Ryan Bates, Callan Bergmann, Michael J. Borges, Brian DeLorenzo, Bonnie Fraser, Stephanie Granade, Kevin Hadfield , Katharine Heaton, Kevin Patrick Martin, Brittney Morello, Brendan Powers, Curtis Schroeger, Josh Tower, and J.T. Turner. Throughout the run of "A Christmas Carol" NSMT will be collecting toys in the lobby for Tiny Tim’s Toy Drive. The theater will be accepting unopened, unwrapped toys for boys and girls ages 2 – 12. All toys will be donated to Toys for Tots. For tickets and information, stop by the box office at 62 Dunham Road in Beverly, call 978- 232-7200 or visit www.nsmt.org.